This is a story about how I traveled along a loop in the rope of time. It starts with what I was told by the little old lady in Pasadena. Okay, I know you are hearing that Jan and Dean tune in your head. No, it wasn’t that little old lady. Yes, she was a little old lady, but she was English, and I met her in Pasadena, Texas. It’s a suburb of Houston, where I grew up. I was fresh out of the UT journalism school, on my first newspaper job. They didn’t trust me with any hard news stories back then. “That’s a real link to history,” I said. Her face was a tracery of wrinkles, but her eyes were bright and blue and seemed to glow from within. She came from a good English family—her father had been a member of the cabinet of Prime Minister Asquith during the First World War. She explained that one reason she had been happy to live in America was that she had a younger brother who went to Cambridge, became a Communist professor, and was recruited as a spy during the Cold War. He was exposed in a scandal known for the most prominent member of the conspiracy, a man known as Kim Philby. Her brother fled in the middle of the night to the Soviet Union in the 1950s and was never heard from again. She said living overseas with her Texas husband helped her avoid the recriminations at home. She and her other siblings sailed on the Titanic with their mother. She explained her father—a conscientious man burdened with Liberal Party duties—had planned to sail with them but was held back by work and sent the rest of the family ahead on a holiday to Upstate New York with a promise to catch up with them later via another steamship. 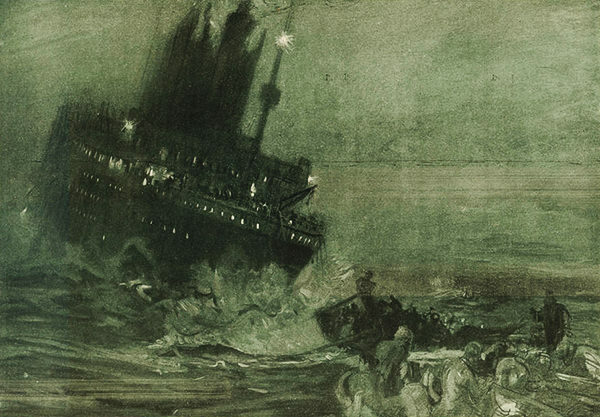 It was a lucky accident—the family was saved, for he might have very well been left behind aboard the doomed ship. “My mother never castigated him again concerning his work habits,” she said. She had a clear, sharp, very British way of speaking. At times, with my East Texas ears, I would have to ask her to repeat herself during the interview. We spoke for 45 minutes and she gave me a wealth of personal details and observations. She was a bright, curious young girl at the time, and it was a fascinating first-person account of a historical tragedy. “Of course, if I can,” I said. “I suppose someone took an old tune and wrote new lyrics,” I said. “That’s impossible, Bette Davis was in pigtails in 1912,” I said. “There was a Texan on the Titanic?” I asked, a bit surprised. She sat back down after serving hot tea for both of us. “As I said, my mother, my older brother, my younger brother and I were off on a holiday to New York,” she said. “We were going to Saratoga. Another family we knew, the Davies, were also on board, and they had a daughter, Elizabeth Anne, who was the same age as I was. We knew each other from school, and we were constant companions on the ship. “We were on the First Class deck when saw the First Officer with a man in handcuffs,” she continued. “The stranger wore an ill-fitting jacket that was obviously borrowed and was shivering violently, which we both thought was unusual. We didn’t feel it was all that cold, it was only 45 degrees that afternoon. “The way the First Officer minded him, it was obvious the stranger was a prisoner who was taken above deck for some air. We overheard some nearby adults say that he was a stowaway, and from his manner of speech, a Texan. Then another officer walked over to the First Officer, who spoke to him briefly, and then undid his own handcuff and hooked it onto the railing. “The First Officer followed the other officer through a nearby door and began to talk into a speaking tube inside. It was obvious he had been called away on an errand. As he spoke he watched the prisoner through a window. “He was heavyset, with steel gray hair and a receding hairline that was obvious even in profile. His eyes were coal-black behind his spectacles. “I was the leader in the Second Texas War of Independence,’ he said firmly. “‘You’ll find out this morning,’ he said thinly. “The man was clearly unhinged. “‘So your name is Bette Davis, eh?’ He pronounced it back like the American pronunciation, Davis not Davies. I don’t think he could hear the difference. “Then he began to chuckle, almost maniacally. He said to himself, ‘It seems so long ago’, then and he began to sing to himself, low but clear. The tune was unfamiliar, the words nonsense. Sheesh gat Bette Davis Ice. “Betty Anne drew back to me. ‘The man’s a raving lunatic,’ she hissed. “The First Officer was coming back out on the deck. We could tell he knew something was up. “That’s the last you saw of the man?” I asked. “That’s amazing, certainly a strange encounter,” I said rather lamely after a pause. “I appreciate your confidence, ma’am,” I said. I did later learn that “Bette Davis Eyes” was an original song, and it wasn’t written in 1981, but 1974. Kim Carnes just lucked out with the best cover, helped with some of the cutting edge electronic music technology in the early 1980s. The few times I saw Nancy Atkins afterward, we never spoke specifically about the stranger on the desk of the Titanic. I think she was uncomfortable with the strangeness of the story, and so was I. Fact was, I’m not sure I believed it—until now. Nancy Atkins died in 1991. She had told me Betty Anne Davies died during the London Blitz, while serving as a nurse. So I suppose I’m the only person alive who knows about that doomed Texan on the Titanic. You’ve probably read and heard how, after the most recent election, more Texans than ever support secession or autonomy. Texans don’t like being on the losing side of anything. The supporters of secession, the Texas National Movement, has gained thousands of members since the last election. And its headquarters are in another Southeast Texas city, Nederland. I’m the managing editor of the paper now. Our staff has been shrinking steadily in recent years now, thanks to the national Recession as well as turmoil and difficulties in the newspaper industry. So when I put a story on the Texas Nationalist Movement onto the news list I decided to do it myself. I drove to Nederland and pulled up to the headquarters in a strip mall. The storefront office was a bustle of activity as volunteers assembled and mailed out membership packets. They all wore t-shirts with the TNM symbol that reminded me of the old Texaco gas station logo. A young man walked out. He was heavyset with dark hair that was just beginning to gray. He had a burning gaze and coal black eyes. He held out his hand. Something went Ding! in my head. “Did you say minestrone?” I quipped. He was intelligent, intense, forthright, and subversive—just the kind of guy to light the powder keg of a second Civil War. It was a long interview, and as we wound down, I had a thought. He pulled a battered case from behind his desk and pulled out an old acoustic guitar that looked like it cost all of fifteen bucks in a pawn shop. Back in the parking lot, I put my elbows on the roof of my car and my head in my hands. Nancy Atkins and her friend thought the Texan was referring to “ice” with the song lyrics he sang on the deck of the Titanic—which was ironic in light of what happened to the ship. They were not familiar with a Texas accent. Our local pronunciation of “eyes” and “ice” sounds very similar—especially if you’re British, I suppose. As Bradbury said, time is like a rope, and now I’ve travelled completely around this loop. It was eighty degrees on that late November day as I stood in the parking lot outside the Texas Nationalist Movement headquarters. Unremarkable weather for a native Texan—who would freeze in a snap if thrown into the cold North Atlantic in April. I know how this story ends. Some day, Dan Millieriestri will reach the end of his rope.